You're an interesting species. An interesting mix. You're capable of such beautiful dreams, and such horrible nightmares. 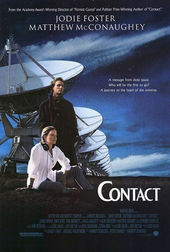 The cleaving abyss issues through a blue-eyed Ellie into the world of Robert Zemeckis’ Contact. The credit sequence for this movie is pretty spectacular, so if you really want to watch it turn me off, now. If you talk to people who [work in] special effects or people who are really interested in the visuals of movies they'll have volumes and volumes to talk about but this opening credit sequence, this amazing backward zoom through the Universe that takes you from the 'too many sounds and too many voices' of who we are on Earth and into the past where all of our sounds and all of the radio signals that we have emitted finally takes you to the quieter place where none of our high volume squeals and noises actually appear. But for those of us who are not that interested in visual effects, like myself, it is a very interesting journey in the film, an interesting journey for the characters. You get this idea that you're in a spaceship, let's say, or some kind of device that is taking you all the way back in time, to a place in the universe where no earthling has ever been. And I guess you have to assume that because this is the point of view of the lead character, Ellie Arroway, that this is her image, her imagination, her idea of what a journey like this would really be like. So, much of the film, as it continues, is pretty much about that same idea. This is the best part, where [the screen] goes very quiet and, if you've ever seen this in a theater, there are a lot of people feeling very uncomfortable because they think the sound just went off in the theater. This is a view of the universe that no one has ever had and it really comes out of Carl Sagan's life's work. We saw all the little spiral galaxies and all the different types of galaxies and now you go into this array which comes out. And as we zoom out, we zoom out of a little girl's eye. The 'ins and outs' of this is that Jena Malone, the actor who plays me, doesn't really have blue eyes, so that's the very first effect in the movie [proper]. Robert Zemeckis: Yes, we did change that logo, we had to, the daylight [version] was too bright to start the movie off. Steve Starkey: We also decided to keep the type style of the original book [for] the main title of the movie. Remember when Carl [Sagan] was first presented with the idea of this opening, Bob? RZ: He said it was great to show the audience the vastness of the universe but he was disturbed that the shot violated every physical law of nature. SS: We thought that was a good foot to get off on. The wonderful thing was that [Carl] went ahead and gave us his favorite space images that he thought of as we were traveling through the universe, [images] we should try to show the audience at the beginning of the movie. RZ: This shot is very impressive and of course it is all done digitally. It is a beautiful job that they did, it's very long. SS: The sounds from the present day overlap [into a] cacophony. RZ: And going back in time. And catching up to broadcasts that have been traveling away from the Earth for a long time. I remember we were struggling with this shot – Michael Goldenberg, the screenwriter, and myself. The convention was to have the camera flying toward the Earth; that's how it was written, that's how the book started, as if it were 'the message' coming at the Earth. It just seemed false and this turned out to be a much better way of doing it. I remember we got that inspiration after talking with Carl. We were flying back on the plane and said 'let's go the other way.' And that just solved all our problems, created as the "Universe In the Blink of An Eye" theme that runs throughout the film. SS: I thought it was very bold that you elaborated the scale of the universe by going to silence in the middle of the sequence. RZ: There is nothing out there [at that point], so there has to be. SS: This gives you a new perspective on planet Earth to look at it from this far out in the universe. You render yourself rather insignificant in relation to the whole. RZ: [Referring to the reveal of the young Ellie Arroway] The thing that I think is so cool about this shot is that Jena's eyes are not really that color; those are Jodie's.